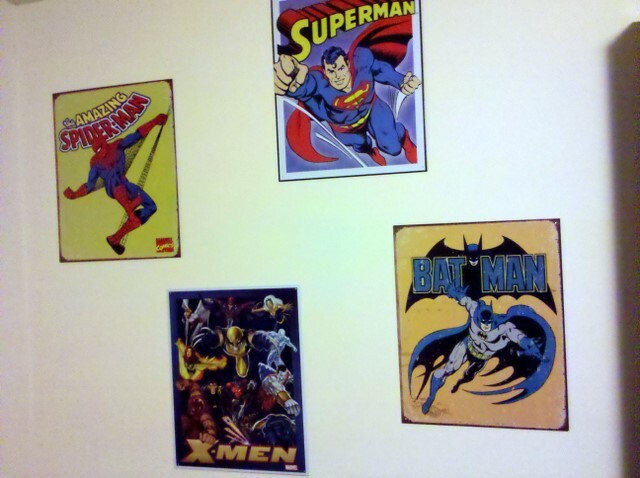 I'm a bit of a late bloomer when it comes to superheroes. I never had many comic books when I was a kid (apart from the occasional Archie and Jughead), and while I watched Spider-Man and His Amazing Friends - an 80s animated series with Firestar and Iceman - it wasn't until I got to college that I learned more about the Marvel and DC universes. I shared an apartment with two guys who were fanatical about Punisher and X-Men, and they each had a large collection of comic books that were kept in pristine condition in plastic covers with cardboard backing. And when we weren't reading those comics, we were crowded around Aidan's computer playing his X-Men game, and because he didn't have any controllers, his poor keyboard had to endure our violently-keystroked flying kicks, laser blasts and psychic blades. Take that, Magneto! And so began my somewhat mild obsession with superheroes and graphic novels. I'm hardly steeped in the superhero lore as some - I don't own any graphic novels because I'm too cheap to buy them, nor do I collect action figurines - but there's just something fun in seeing the good guys beating the crap out of the bad guys with well-placed lightning strikes, sonic screams and admantium claws. And then strike a pose. I've been asked if I have a favorite hero - I don't. (There many that I don't like at all, but that's for another posting.) Sometimes I find the individual story lines to be a bit boring (too many words in those bubbles, and not enough action - hey, I never said I was an astute reader...), so I generally prefer teams, where the mayhem is super-sized. X-Men is how I started out with superheroes, so I've never lost my liking for this ever-changing roster of characters, including Cyclops, Storm, Rogue, Shadowcat, Emma Frost, Colossus, Angel, and the rest of the gang. After reading through Joss Whedon's Astonishing X-Men run, I'm now making my way through the New Avengers series, which features the unlikely crew of Captain America, Luke Cage, Dr. Strange, Wolverine, Spider-Man, Spider-Woman and Iron Fist, up against Iron Man and the rest of the Marvel Universe after the Civil War sparked by superhero registration. And since I love pretty much anything Whedon-esque (including his Buffy Season 8 comic book series through Dark Horse), I'm looking forward to seeing what he does for the Avengers live-action movie that he's been signed to helm. I'm not a huge fan of the DC Universe, except for the Justice League and Teen Titans. I own four seasons of Justice League and Justice League Unlimited on DVD that I've watched countless times. What's really cool is recognizing several voices as belonging to actors that I know (again with the Whedon connections) - Morena Baccarin (Firefly, V) as Black Canary, and Amy Acker (Angel, Dollhouse) as Huntress - and other actors, like Fred Savage (The Wonder Years) as Hawk, and Jason Hervey (who played Fred's brother on Wonder Years) as Hawk's brother, Dove. And, I have to admit that even a good storyline like Identity Crisis - which focuses on the DC Universe's response to the murder of Elongated Man's wife, Sue Dibny - choked me up a bit, which I attribute to amazing artwork and fine storytelling. Even if it is only in 2-D. So, with this in mind, it should come as no surprise that I just about peed my pants with excitement when I saw these "vintage" metal posters at a store in Wicker Park. And though they adorn my office wall, on their own as characters, I find Batman a bit dark, and Superman a bit too goody-two-shoes (although Superman Returns is among my favorite superhero movies). But as part of the Justice League, they're among a larger group of characters, so I don't mind them so much. And Spider-Man is growing on me, especially as part of the New Avengers team. Oh, and if I could have any power I wanted, I'd want to be telekinetic. So I could do the greatest damage from a distance and not have to get my hands dirty. Like Jean Grey. Before she was Dark Phoenix. And before Marvel killed her off. Again. And again. You get the picture. The Batman poster looks especially vintage. I hope your office has a window.